A classic Christmas treat, the mince pie has a curious history. In the UK it’s hard to get through the festive season without indulging in a buttery bite, but did you know that many countries wouldn’t know a mince pie if they saw one? According to tradition, you must always make a wish on the first mince pie you eat during the Christmas season. It may be too late now, but remember for next year! Most people have questioned why these little pastry pies are named what they are. The early mince pie was known by several names, including mutton pie, Christmas pie and shrid pie, as they typically contained minced meat and were savoury, hence the name. Through history mince pies got smaller and smaller, until they became the perfect bite size in which we know them. 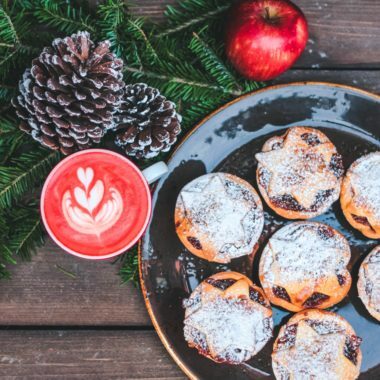 We love them like this, but in America you will rarely get a small mince pie – they are generally full-sized pies intended (but not solely) for sharing. The cinnamon, cloves and nutmeg ingredients were included to represent the gifts given to Jesus by the three Kings, making them a traditional Christmas snack. 5/ They’re Not Actually British! British crusaders returned from the Middle East in the 13th Century bringing back recipes of a version of these delicious pies which included meats, fruits and spices, inspiring our classic mince pie that we devour today. But don’t worry – we are still including them in our Christmas Gift Box! Early recipes included hard-boiled eggs and cheese! Well… not anymore. They were banned during Oliver Cromwell’s reign over England, as anything related to what they saw as frivolous, godless tradition was made illegal. Missing mince pies whilst you are abroad? Or know someone who might be? Our Christmas Gift Boxes both include the delicious pastry treats, so order one by Friday the 14th December (find specific pre-Christmas delivery dates here) to ensure the box arrives by Christmas Day!